October 2014 marks the 25th anniversary of the founding of the Orchestre Révolutionnaire et Romantique. 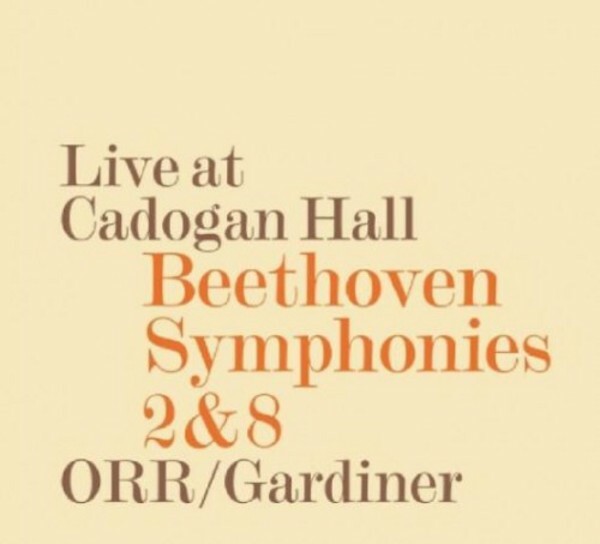 Twenty years after their acclaimed Beethoven Symphonies recordings for Deutsche Grammophon, Sir John Eliot Gardiner and the orchestra continue to revisit this repertoire - this album follows the release of Symphonies 5 and 7, recorded live at Carnegie Hall. The Second and Eighth, two of the 'lighter' symphonies, are among Sir John Eliot’s favourites. The Second’s life-affirming energy is rooted in Mozart and 18th century opera, at times romantically tender and at others ferociously determined. Beethoven’s adventurous spirit can be heard in the Eighth, which is buoyant and energetic with a spirit of wit and playfulness. The album is presented in a digipack and contains a 28 pages booklet with original notes by BBC presenter and music journalist Stephen Johnson, translated into German and French.